I wanted to see if I could come up with an entire month of scary movies leading up to Halloween and the result was the Ultimate Horror Movie Calendar! If you’re a fan of the genre at all, you’ll likely have heard of most of these movies. Many of them are classics and should be on your must-watch list anyway. There are also many recent horror hits that are sure to become classics. The Ultimate Horror Movie Calendar is 31 days of terror (and fun). The movies in this list are SCARY and not appropriate for kids. If you’re looking for Halloween movies that are good picks to watch as a family, check out this list of Spooky Halloween Movies. Below are the 31 movies I selected for the Ultimate Horror Movie Calendar. There are lots of other great horror films for sure. For this list though, I tried to create a variety so that hopefully you’ll find a few new scary movies you might otherwise have missed. Don’t worry, you’ll still find many of your favorites on the list too, even if you don’t know all of the titles. 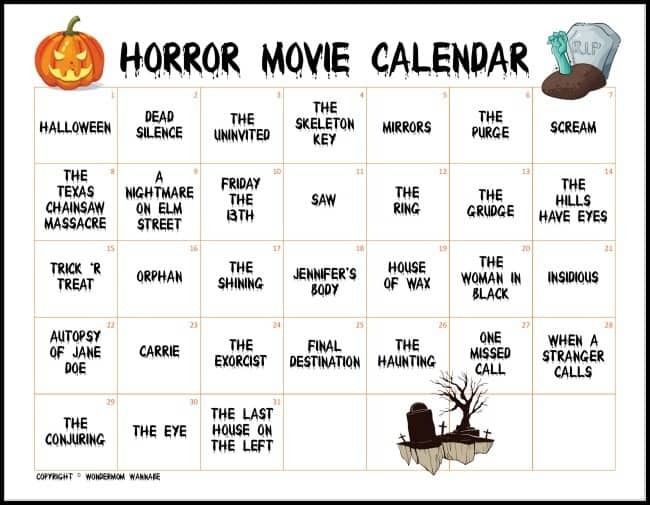 Print off this handy calendar to keep track of which movies you’ve seen or as a countdown to Halloween. Now that you have the Ultimate Horror Movie Calendar, it’s time to figure out how to watch them! Many of the titles on the list are available on Netflix. If you have an Amazon Prime membership, several of the movies in the list are available for free on Prime Video. If you don’t have a Prime membership, you can sign up for a 30-Day Free Trial . You can still watch movies on Amazon Video without a Prime membership, you’ll just have to pay a rental fee or purchase the movie to watch as often and whenever you want. That’s one great list of horror movies and a great calander! Thanks.